“No information may remain classified indefinitely.” –President Obama, in Executive Order 13526. A version of this article originally appeared in Perspectives on History, an American Historical Association publication, with an introduction by Allen Mikaelian and alongside articles by former chief CIA historian Kenneth McDonald, and Cuba, Latin America, and the Caribbean historian Michael Bustamante. 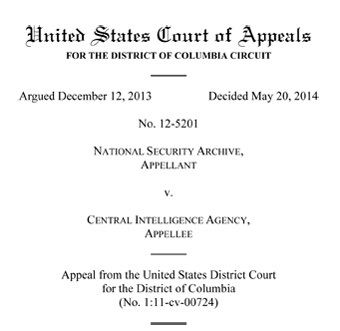 The National Security Archive was disappointed, but not surprised, that in a two-to-one decision the DC Circuit Court of Appeals, in May 2014, agreed with the Central Intelligence Agency that a volume of its 30-year-old history of the 53-year-old Bay of Pigs Invasion could “confuse the public” and should thus be kept secret. To win this argument, the CIA successfully convinced Judges Brett Kavanaugh and Stephen Williams (Judge Judith Rodgers identified multiple contradictions in her strong dissent) that any document the agency deems “predecisional” can be withheld ad infinitum. The claim that the entire universe of “predecisional” documents–including any claimed “draft”–should be withheld from the public is in line with the agency’s information withholding strategy. The agency has found that it is much easier to withhold entire universes of documents than argue the merits of classification to protect US national security on a case-by-case, document-by-document basis. The CIA got its first taste of “universal withholding” when Congress passed the 1984 CIA Operational Files Exemption. Unlike other Freedom of Information Act exemptions, which can be applied after agencies search and locate requested documents, the Operational Files Exemption creates a universe of documents that the CIA does not even have to search for. This means that if a historian requests records for, say, Operation Phoenix, the CIA-led assassination program conducted during the Vietnam War, the CIA will reply–less than completely forthcomingly–that its search has returned no results. Admiral William McRaven, the Joint Special Operations Commander who oversaw the Osama bin Laden raid, knew about this transparency black hole: he ordered the FOIA-complying Department of Defense to purge its computers of all files on the Navy SEALs raid on bin Laden and send them to the CIA, where the Operational Files Exemption would keep them “safe” from search and review for release. Of course, very few historians would argue that FOIA requests should disclose the names of undercover CIA operatives, their foreign sources, or many intelligence methods. But when the CIA’s use of this exemption is examined, it is clear that it goes far beyond these reasonable protections. The agency has stretched the limits again recently to begin arguing that even histories of the Clandestine Service, including its actions in Italy and Hungary more than six decades ago, are exempt from search and review under the Operational Files Exemption. By definition, a history cannot be an “operational file,” yet that is what the CIA is allowed to claim to FOIA requesters. 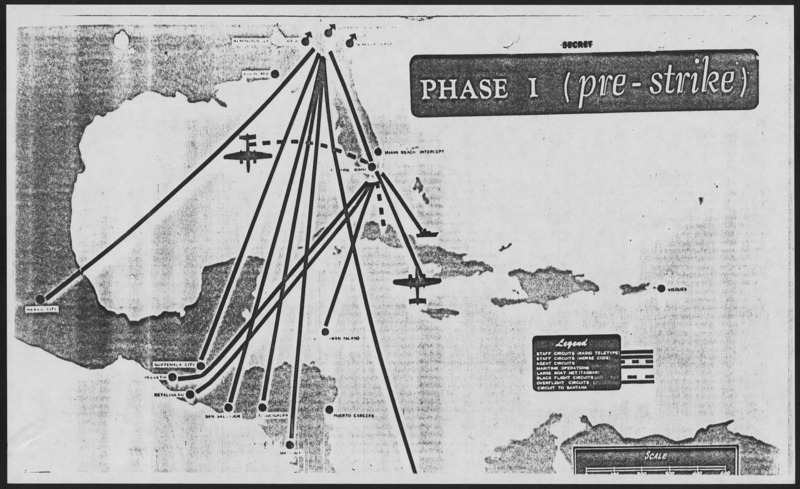 Troublingly, the CIA’s withholding of its Bay of Pigs history is an attempt to keep another universe of documents from disclosure: those it claims are “predecisional.” The CIA is seeking this expansion because key figures within the US government have begun reviewing the CIA’s classification decisions and overruling the agency’s claims for the need of secrecy. The Interagency Security Classification Appeals Panel (ISCAP), housed at the US National Archives, overrules government classification claims in more than 70 percent of the documents it reviews (including those of the CIA). Annex No. 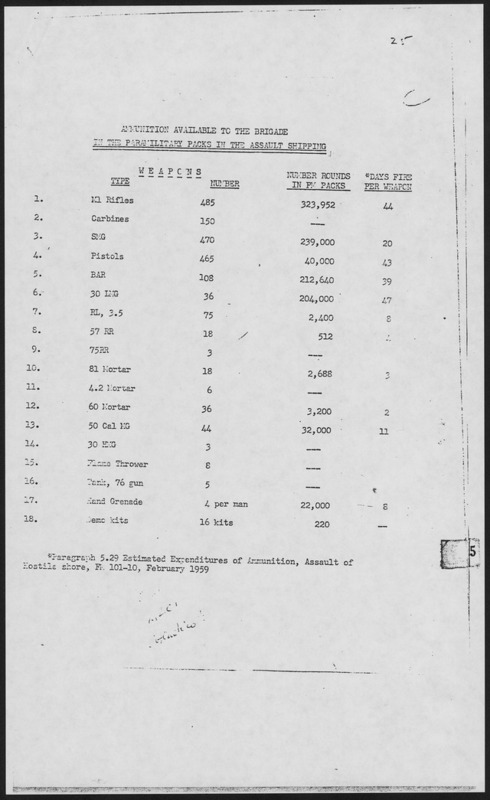 25 Ammunition Available to the Brigade from the National Archives. Lucky this wasn’t from a draft! To avoid being overruled by ISCAP, the CIA has employed two tactics. First, it uses the Operational Files Exemption so that requesters cannot officially identify classified documents for ISCAP to review and overturn. Second, it has begun to stop withholding some documents because they are classified (which ISCAP could overturn) and instead withholds them because they are “predecisional” (which ISCAP has no authority to overturn). The CIA’s shell game is an affront to those who strive to compile an accurate history of US intelligence, foreign policy, and national security history. The CIA also strives to obstruct the declassification efforts of holders of releasable universes of documents, including the presidential libraries and the Department of State. At the presidential libraries, the CIA has installed a Remote Archives Capture (RAC) system where it claims authority to digitize all documents at the libraries and first crack at keeping them secret–often using the Operational Files or “predecisional” exemptions–before letting the library, and other agencies, review the documents for release. The RAC system was installed, at least partially, in reaction to the presidential libraries acting with too much autonomy in their declassification decisions and in releasing to the public documents the CIA wished to keep secret. RAC is the primary reason for overclassification and the decades-long waits for declassification at the presidential libraries. The CIA does have some robust methods for disclosure—for information within the universe that they want disclosed. The agency has a large online library of books, monographs, and documents on subjects such as directors and deputy directors of the agency, and intelligence successes such as Cold War Polish double agent Colonel Ryszard Kuklinski. Their FOIA processing and release of analytical reports is also fairly strong. But in a swipe at both 21st-century industry standards and at historians, the agency steadfastly refuses to post its full CIA Records Search Tool (CREST) database online. Instead researchers must travel to the National Archives or a presidential library to use it. The CIA’s explanation: a fear of the Mosaic Principle–the piecing together of documents to discern information the agency wants hidden. Of course, the Mosaic Principle is one routinely used by historians. This year, even the general counsel for the Director of National Intelligence, who is nominally in charge of the CIA, instructed that classifiers and declassifiers must ask “not can we classify, but should we?” As the Bay of Pigs case shows, the CIA has ignored this instruction, continues to keep universes of documents secret, and refuses to review harmless documents of historical importance. The agency’s antipathy toward history will not change until historians organize a movement strong enough to force it. Insiders know a real history of the Bay of pigs would reveal that George Bush Sr was a recruiter and fund raiser for the operation “Zapata” his oil company front and involvement with CIA. So if they ask “should we release?” ~ all of this which will relate to Nixon’s known reference to the Watergate Blackmail attempt on CIA and FBI as lay off or this will expose the “Bay of Pigs thing”, code for JFK coup, of course by rules it cannot be released. Why? Well, the government cannot release anything that would damage Foreign relations, as well as reveal methods and sources. Here is how they do it on Torture too even to the Senate. Everything is a Catch 22. We need a tool that allows the public to crowdsource mosaic principle research of CIA and other government documents. Think about it – tagging PDFs with shared cryptonyms, for example. Careful not to utter the word, “mosaic”. Certain agencies will suddenly turn into that guy from the movie, A Beautiful Mind, and start seeing things that aren’t there; crazy, they used to call it in the old days. The original documents of the Bay of Pigs invasion could “Confuse the public” apparently, therefore the public will never get their hands on them.